Looking for the perfect new vehicle? At St. Albert Honda, we have the perfect recipe for success: a passion for customer service, the incredible Honda lineup, and you! Our award-winning sales staff is ready to wow you with a vehicle purchasing experience to remember. 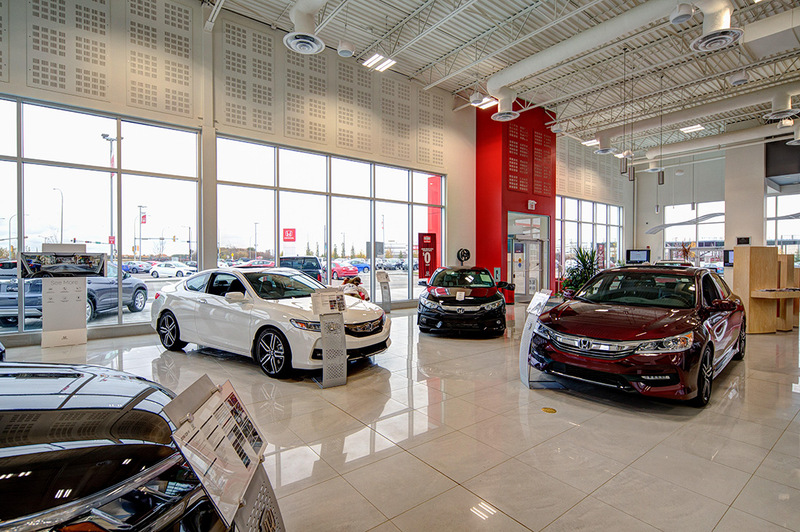 Whether you’re looking for a new Honda car, truck, SUV or van, St. Albert Honda is focused on what you need from the moment you walk through the door. We provide a no-pressure sales environment so you can make your next vehicle decision on your terms. Honda’s unbeatable model lineup combines the very best in comfort and practicality with industry-leading safety, fuel economy and driving fun. An investment in Honda’s level of quality, reliability and durability is something people can count on. Explore models like the versatile Honda Fit and the legendary Honda Accord lineup, which has been consistently named one of Car & Driver’s 10 Best. The Honda Civic has been Canada’s bestselling car for 20 years in a row! Honda Canada is continually focused on maintaining that mark and only increasing it for years to come. The dynamic Honda Civic lineup offers various trim levels to choose from including the Civic Coupe, Civic Sedan, Civic Hatchback, and the Civic Type R.
Honda’s outstanding lineup of SUVs, trucks and minivans are sure to impress! From the sporty Honda HR-V to the consistently reliable Honda CR-V and the groundbreaking Honda Pilot, Honda’s SUV lineup has something for everyone’s budget and lifestyle. Experience the excitement of the Honda Ridgeline with its unique SUT look and the Honda Odyssey which has redefined the look of a family vehicle into a sport-inspired marvel. Every vehicle in the Honda lineup comes standard with a variety of safety and utility features that complement its stylish look. The multi-faceted Honda lineup awaits you at St. Albert Honda. St. Albert Honda (formerly Frontier Honda) has been serving Albertans since 1979. The team at St. Albert Honda is always excited to welcome our new and returning customers at our state-of-the-art facility. We’re proud to serve clients from St. Albert, Edmonton, Morinville, Gibbons, Bon Accord, Namao, Westlock, Barrhead, Fort McMurray and anywhere else, a fantastic sales and servicing experience. At St. Albert Honda – It’s All About the Experience!